Setting goals can be a joy and a curse. The planning stage is bliss, full of possibilities and wonder. But once the pursuit begins, it can feel like an obligation. Our family has had lots of changes this year, nothing bad, just busy and I've found myself feeling anxious. So I felt it was time to create some goals for myself to get my mind occupied. But the thought of having to accomplish a bunch of things didn't sound too calming either. So I decided to start with Happy Goals instead. Goals just for fun's sake ~ goals to make me happy! If I like it, I may do it monthly. Feel free to join in and make your own happy goals. We can cheer each other on! 1. Blog more. I love blogging. It seems that anytime life pulls me away from it, I end up returning in the long run. There is something invigorating about creating a post and putting out there for the world to see. 2. Paint two abstracts. Painting is the most calming experience for me. It allows me to process things I have trouble thinking through while also allowing me to play with color and beauty. 3. Go swimming. This sounds like a no-brainer for summer. But now that my kids are older, they don't need me with them at the pool so I don't go much. And I LOVE swimming! We have a neighborhood pool literally down our street. I even got a new swimsuit this year that I actually like! There really is no excuse, this one needs to be crossed off ASAP. 4. See a movie at the drive-in. I noticed Wonder Woman is playing there this week! How cool would that be? The only drawback was it was paired with Baywatch . . . ew, what were they thinking? 5. 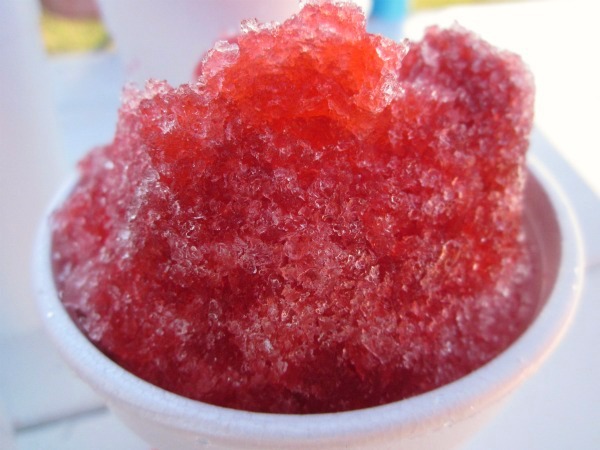 Get a sno-cone at Josh's Sno Shack. There are so many flavors and it just sounds refreshing. (Watermelon is the best!) Now I'm just making myself thirsty. Okay those are my happy goals for this month! I'll let you know how many I manage to cross off. If you do it too; I'd love to see your list! That's awesome! I feel like blogging is the greatest way to sort your thoughts--perhaps that's why we analytical minds constantly revisit this medium. I think you're right about the analytical ones! I know what you mean about swimsuits; it's so hard to find one with all the right features. I just lucked out this year somehow! Good to "see" you, Kimberly!